BVLGARI introduces a limited edition of 30 pieces watch that has been created in exclusivity for Greater China. Subtle and contemporary, the model features a case (35mm) shaped like a snake’s head to form a natural extension of the two twirl bracelet, graced by diamonds and rubellite in a delicate alternation with rose gold. The case is set on 38 brilliant-cut diamonds (0.29 cts) framing the white lacquered dial. The new creation will be embellished with the Bulgari’s exceptional mastery of jeweller-watchmaker in keeping with the finest Bulgari traditions. Associated with luck and joy, the red colour of rubellites perfectly blends with rose gold and is exalted by the bright light of diamonds. In the wake of this inexhaustible inspiration, Bulgari will celebrate with China this iconic motif in brand’s history by presenting the limited edition watch creation from the Serpenti Jewellery collection that will be available only in the Chinese market. From East to West, in ancient Greece and in the Roman world the snake has been a powerful symbol as well, emblem of wisdom, rebirth and vitality, ornament and talisman at the same time. In the 1940s, consistently with its Mediterranean cultural legacy, Bulgari caught the expressive strength of this millennia old sign and introduced its first sinuous Serpenti timepieces, marking the beginning of its success in the field of wristwatches. Since then, the Serpenti motif is indissolubly intertwined with the Bulgari’s history and identity, as a perfect embodiment of the brand’s multiform creativity. 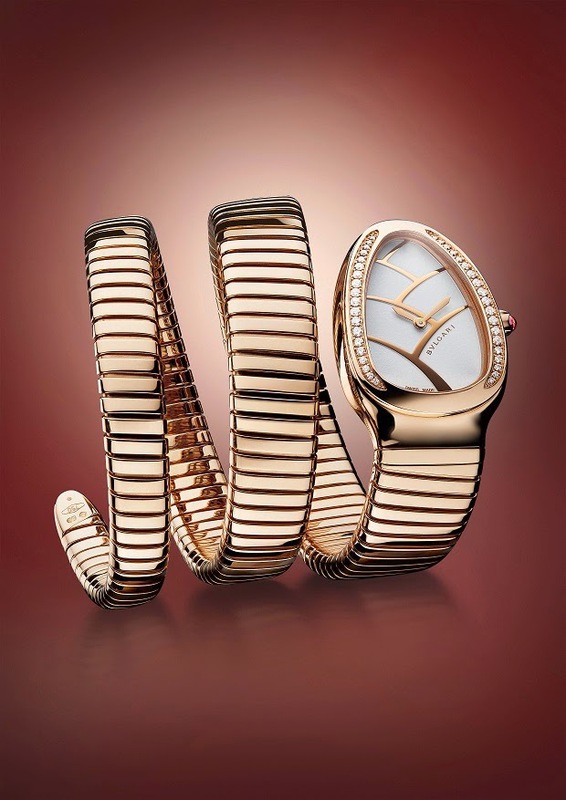 From precious gemstones to enamels, from the celebrated Tubogas bracelets to refined gold scales, the semblance of the snake has evolved decade after decade in tune with the inspiration of Bulgari’s creativity. The subtle and delicate variations in the crafting of the Serpenti bracelet have always preserved the innate suppleness and flexibility of this jewellery masterpiece.